Wireless cameras come in handy especially since there are minimal cabling involved. Most of the have a cable feature just in case you need to improve its accessibility or the speed with which information is transmitted. because honestly, wireless systems can be at times sluggish. The cameras come packed with most essential features such as two way communication, onboard storage of upto 128gb sdcard, and infrared technology. They are ideal for remote locations where cabling is impossible or can be used as nanny cameras. Depending on the clarity that you need, you can choose between, 1MP, 2MP, 3MP, or 4MP resolution. 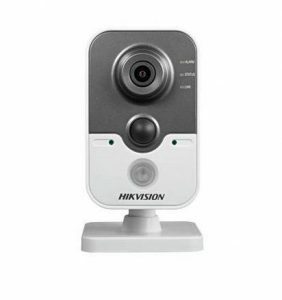 One such camera is the Hikvision Cube Camera. Hikvision’s DS-2CD2422FWD-IW Network Cube Camera supports the fastest built-in wi-fi technology for wireless video management. 2.8 mm and optional 4 mm lenses provide an IR range of up to 100 ft (30 m) for optimal nighttime viewing, which is aided by passive infrared detection.